Col. David Richardson, Commander, Bavaria Health Command, and Command Sgt. Maj. Christopher Earle, salute the colors with Brig. Gen. Norvell Coots, Regional Health Command Europe Commander, at the BHC Activation Ceremony in Vilseck, Sept. 25. VILSECK, Germany – The Bavaria Health Command was officially activated in a ceremony on Dragoon Field, Rose Barracks, Sept. 25. BHC replaces the former United States Army Medical Department Activity Bavaria, better known as BMEDDAC. The activation is part of a larger MEDCOM reorganization to achieve a balanced, agile and integrated organization better aligned to enhance the Health Readiness for the Army Force 2025 and beyond. BHC has mission command responsibilities for six clinics and approximately 40,000 beneficiaries throughout six communities in Germany – five in Bavaria and one in Baden-Wuerttemberg. Col. David Richardson, commander of the BHC, spoke during the ceremony about the legacy and history of the unit. As far back as 1943, as the 33rd Field Hospital in California, the unit moved through Morocco, Algiers and Italy, before reactivating in France, and then finally reactivating again in Wuerzberg, Germany, in 1965, he said. The Wuerzberg Hospital served medical units and patients across Germany in the 1960s and 70s, until it reflagged as the Wuerzberg MEDDAC in 1975. 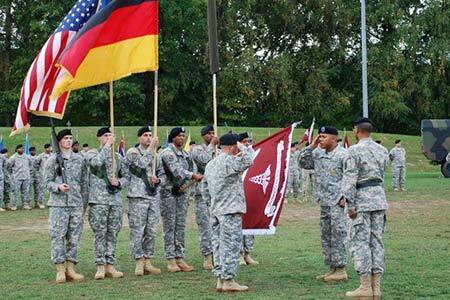 In June 2007, the USAMEDDAC Wuerzberg was officially renamed USAMEDDAC Bavaria, and the mission command headquarters was moved to the present location on Rose Barracks, Vilseck, in 2008. “A part of this organization’s history is still with us today as 24 Local National employees, who worked at the former Wuerzberg Hospital, relocated with USAMEDDAC Bavaria during the move in 2008 and are still actively working for us as we transition to the Bavaria Health Command,” Richardson said.